We’ve previously posted an article discussing a list of responsibilities a flight attendant has that people may not be aware of. Now it seems there’s more to flying which we passengers need to be more educated on as there may be some ground rules we aren’t aware of either. This is what sparked this Facebook post that has been going viral on social media recently. 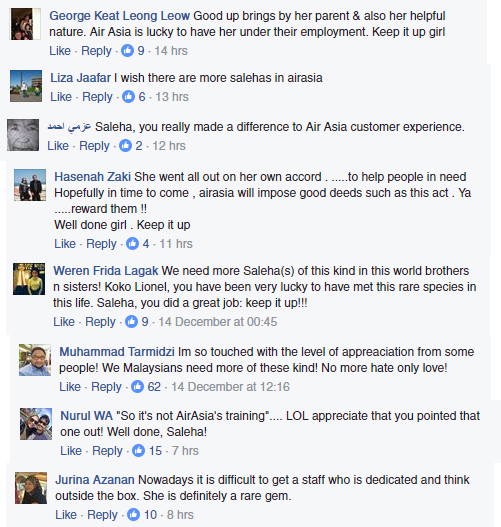 On December 13, Facebook user Lionel Tan posted a testimonial on Air Asia Malaysia’s Facebook page about his experience with a staff that left him with a really good impression. Lionel shared that due to a slipped disc problem, he usually carries his backpack on a foldable shopping trolley which he had no problem getting on board previous flights for the past 8 months. Last Friday however, he was stopped by an Air Asia staff when he was about to enter the departure hall at KLIA 2. “I was upset as there had been no trouble bringing my trolley in before. My protests were useless, and she asked her colleague (Saleha) to bring me to see the supervisor, who confirmed that it was not allowed as it was made of metal—I had to go get it wrapped and check it in. With half an hour to boarding time, I did not think I would make it and continued to protest,” said Lionel in his post. So the staff named Saleha decided to take matters into her own hands and help Lionel so that he would not miss his flight. Since he had nowhere to dump his trolley at, she offered to take the trolley into safekeeping until he returned so she could pass it back to him. “She asked when I was coming back. I told her Monday night. She said she would be working then. I took her number and thanked her, and went in to catch my flight. While waiting to board my return flight on Monday night from Miri, I contacted Saleha to ask if she was at work already. She said she had to start at 3 am, but not to worry, she would bring the trolley for me. When I came out to the arrival hall, there she was, waiting with my trolley!” said Lionel. Upon passing his trolley back, Saleha even took the time to explain the actual rules and regulations of the airport. She informed Lionel that trolleys or metal objects in general are not allowed on board any flight as it could pose as a potential weapon threat but she commiserated as she understood how people might have back problems, so no one should be blamed in this situation. To thank her for the fuel and trouble it took for her to personally hand-deliver his trolley back to him, Lionel gave her a token of compensation and thanked her for taking time out of her day to do this kind deed. Saleha kindly replied that she lived nearby so it wasn’t a long drive. But Lionel felt that wasn’t enough to show his appreciation so he made this post and specially addressed Tony Fernandes himself. Lionel requested for Tony to take good care of Saleha and provide her the proper grooming in the company to prepare her for better things as he believes she could go far with her kind heart and dedication to proper customer care. This inspirational story has gone to spread wildly on social media, grabbing the attention of various netizens as they commended Saleha for her great showmanship of selflessness. The post has since been shared close to over 1000 times and has over 5000 likes. 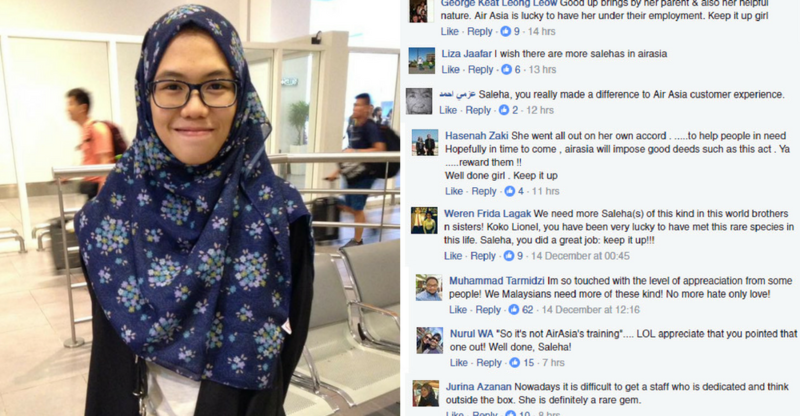 Comments from the netizens show their support for her inspirational behaviour and that they hope to see such attitude being replicated by others as well. Kudos to Saleha for showing us that true customer service still happens!